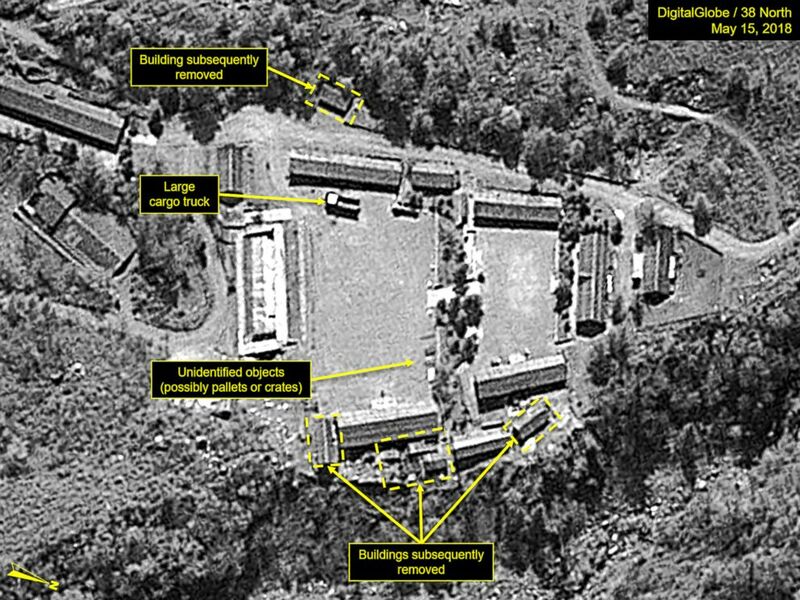 North Korea is set to dismantle its nuclear testing facility at Punggye-ri this week in front of a delegation of two dozen handpicked foreign journalists. The journalists flew on a chartered plane Tuesday from Beijing to the city of Wonsan on the east coast of North Korea and were set to be taken on a long journey to the nuclear site near the village of Punggye-ri. From Wonsan, the group is expected to travel at least 11 hours on a train up the coast and another four hours into the foothills of Mount Mantap by bus and then finally an hourlong hike to the nuclear test site, according to reporters there. Figure 6a. Overview of Main Administrative Area on May 15, prior to removal of several buildings and significant landscaping effort. The research group 38 North said an analysis of satellite imagery taken Monday showed that what was probably an observation platform had nearly been completed at the test site and that improvements had been made to a nearby road and pathway. Another probable observation position had appeared to have been placed on a hillside there, the group said Tuesday. Figure 7. Apron on former South Portal spoil pile has been expanded and smoothed. Journalists from the U.S., China, U.K. and Russia were among the small group invited to witness the process but The Associated Press reported eight South Korean journalists, who were initially invited, were refused visas after they arrived in Beijing to connect onward to North Korea. The decision coincided with latest protests from Pyongyang over the U.S.-South Korea military drills. No experts were among those invited. South Korea’s President Moon Jae-in’s government expressed regret over the decision to exclude their journalists just as Moon prepared to meet with President Donald Trump in Washington, D.C., Tuesday to discuss Trump’s planned summit with North Korean leader Kim Jong Un in Singapore. The meeting was scheduled for June 12, but Trump said Tuesday "it may not work out for" that day. 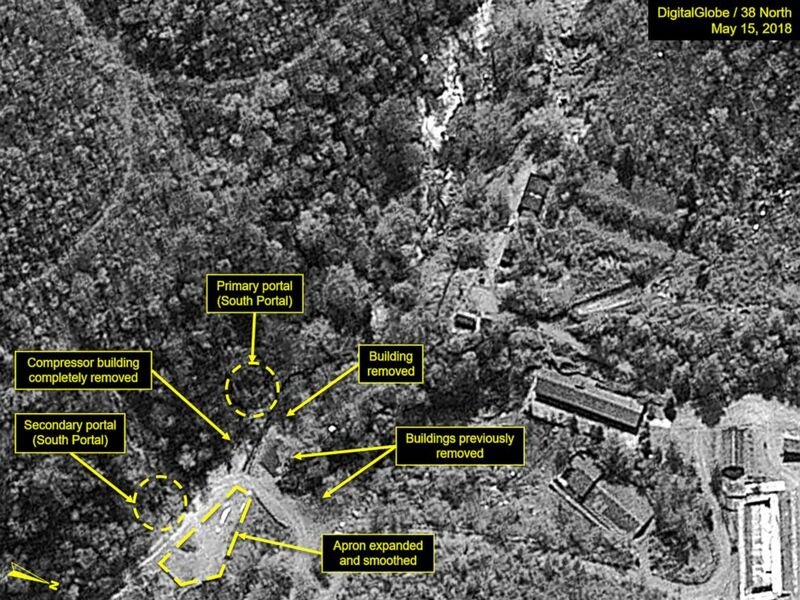 A satellite image from Sep. 1, 2017, shows a pre-existing small slide on North Korea’s Mt. Mantap. 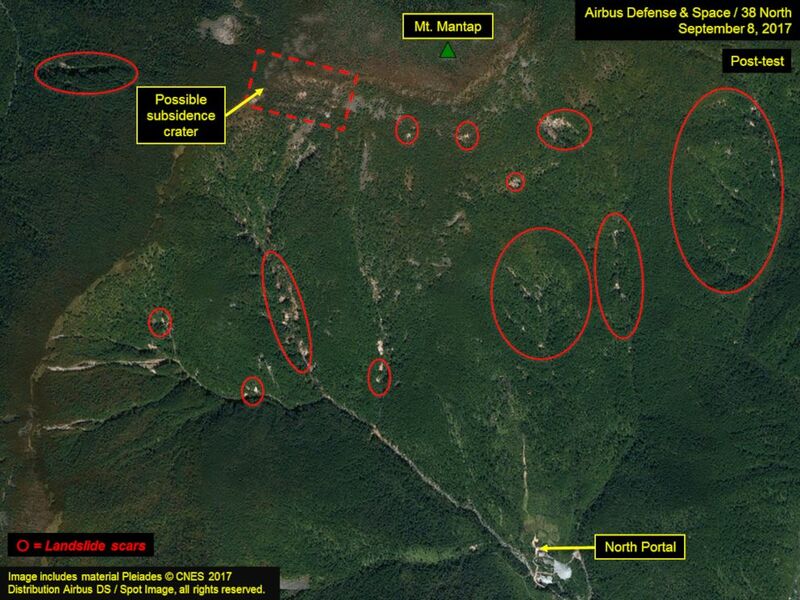 Punggye-ri in the northeast of the country has been the site of every one of the six North Korean underground nuclear test from 2006 until the most recent one on Sept. 3, 2017. 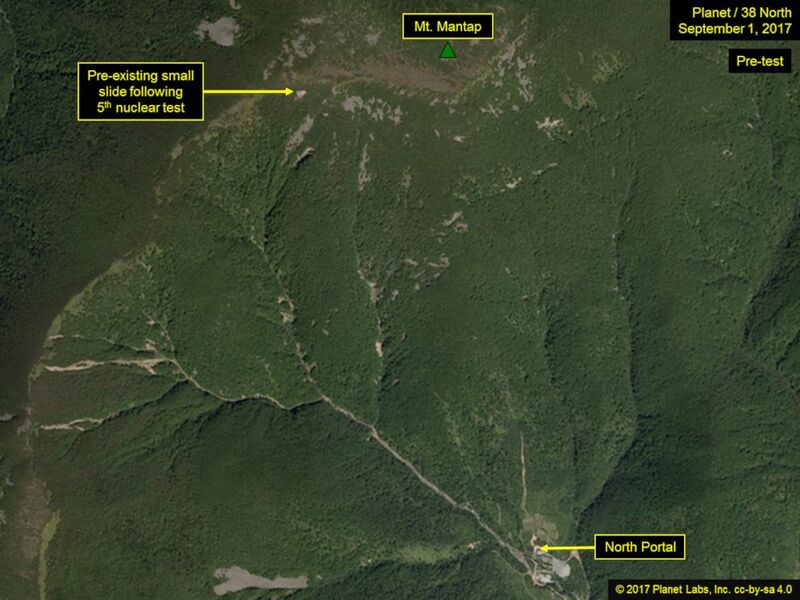 The facility is built into the granite base of Mount Mantap roughly 100 miles from North Korea’s border with China. A satellite image from Sep. 8, 2017, shows a possible subsidence crater and several landslide scars following a nuclear test at North Korea’s Mt. Mantap.